In Collaborative Couple Therapy, loss of voice is substituted for resistance as the key pathological element. Loss of voice precludes expression of heartfelt feelings – the partners’ underlying longings and fears. We take the fight that is occurring at the moment and, by discovering the partners’ heartfelt feelings, transform it into a moment of intimacy and induce a collaborative spirit. 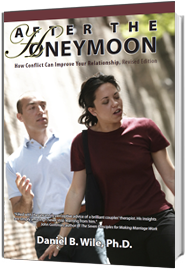 This turns the relationship into a curative force for solving the couple’s moment-to-moment relationship problems and each partner’s family-of-origin problems. 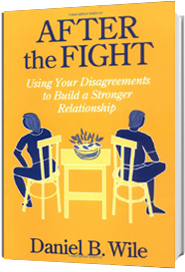 A defining feature of this approach is a recognition of how therapists grapple with the same problems the partners do: being pulled into adversarial states, where they lose the ability to appreciate each partner’s point of view, or into withdrawn states, where they lose the ability to engage at all. The task of therapists is to recognize their reactions as clues to the relationship problem of the moment, which is the partners’ inability to express their heartfelt feelings. Wile, D. B. (2002). Collaborative couple therapy. In Gurman, A. S. & Jacobson, N. S (Eds.). Clinical handbook of couple therapy, Third edition. New York:Guilford, pp. 281-307. Wile, D. B. (2011) Collaborative couple therapy. In Carson, D.K. & Casado-Kehoe, M. (Eds.) Case studies in couples therapy: Theory-based approaches. New York: Routledge. pp. 303-316. This is not a paid announcement - political or otherwise; ) It is a tribute to the man in the field who has made the greatest impact on the services I provide in the room, transforming and empowering my sessions. I find couples work to be among the most demanding and challenging of specialty areas and am deeply thankful for Dan's contribution to the field. Although I have trained with David Schnarch (differentiation) Sue Johnson (need I say attachment?) and the Bader's (Developmental Model) among others, it is Dan's voice that has left the greatest imprimatur on my treatment of couples. 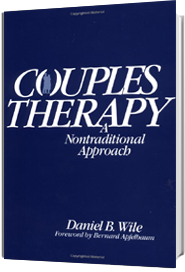 If you enjoy the presentation, check out Dan's text "Couple's Therapy: A Nontraditional Approach. " This book is a powerful resource, in that it compares and contrasts the interventions of a number of orientations to a given issue and provides a rationale for his collaborative approach in a clear and concise manner. Looking forward to shared growth and professional development.